Tesla said that it intends to built 2,500 Model 3 vehicles by the end of Q1 and 5,000 by the end of Q2. But it also said that a troubled Model 3 ramp means those goals aren’t certain. On the plus side, it expects to sell another 100,000 Model S and Model X vehicles in 2018. Tesla lost less money in the fourth quarter than expected – and brought in slightly more revenue than analysts anticipated. However, the carmaker still lost almost $US12 per share in 2017, on a nonadjusted basis, more than double its 2016 loss. A big loss that’s not as big as anticipated is still a big loss. And that loss can largely be attributed to the glacial production ramp of the Model 3, Tesla’s car-for-the masses. In its Q4 and full-year 2017 investor letter, the company restated its goal to produce 2,500 Model 3s weekly by the end of the first quarter and take that to 5,000 by the end of the seconds. However … there’s a but. “While these are the levels we are focused on hitting and we have plans in place to achieve them, our prior experience on the Model 3 ramp has demonstrated the difficulty of accurately forecasting specific production rates at specific points in time,” the company said. So Tesla isn’t making any promises about those goals. This is, as far as the auto industry goes, strange. 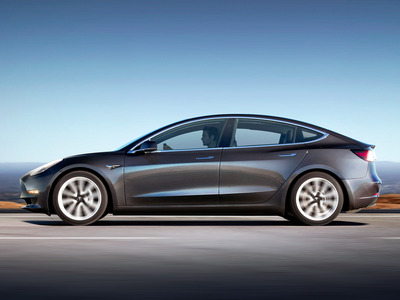 The Model 3 officially launched last July. It’s now February and Tesla isn’t really sure how many it can build. It also claims to have additional pre-orders on the books, each secured by a $US1,000 refundable deposit. There could be close to 500,000 of those now, meaning that some customers could be waiting literally years to take delivery of a vehicle. Every other carmaker in the world could tell you exactly how many of a certain type of vehicle it will manufacture by a given date, give or take a few hundred. Tesla’s vagueness of this particular point may be alarming to some. What isn’t alarming is the apparent stability of its Model S sedan and Model X SUV expectations. Tesla is guiding toward another 100,000-vehicle year, more or less matching 2017. The contrast between the relative certainty of Model S and X and the uncertainty of Model 3 might look troubling, but investors should probably take heart. It means that although Tesla hasn’t managed to make money in 14 years, it has a stable and potentially profitable core business.